Gumbo is a stew-like dish that originated in Louisiana. It is typically made of a strongly flavored stock, a thickener (okra, filé powder, or roux), meat and/or shellfish, and vegetables. The National Gumbo Day is celebrated on October 12 across the United States. 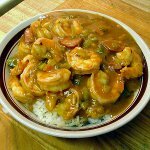 Just like Louisiana itself, Louisiana's signature dish is a fusion of many cultures. Gumbo combines the culinary practices of French, Spanish, African, German, Italian, Choctaw, Cherokee, and Alabama cuisine. Gumbo was invented in the early 19th century when people of different cultures had to live together within a small area and the cultures influenced one another. There are three main types of gumbo depending on the thickener used. Gumbo can be thickened with okra (bamia), an African vegetable; filé powder, dried and ground leaves of the sassafras tree; roux, the French thickening agent made of wheat flour and fat. Gumbo is usually prepared beforehand because it often simmers all day. Gumbo is usually served hot directly from the pot it was cooked in. It can be served with bread as the sole course in a meal. Creole gumbo is typically served over hot rice. To celebrate the National Gumbo Day, treat yourself to the most famous Louisiana dish!